Basil is no longer just for your mum’s finest spaghetti bolognaise! In fact, The Kent and Sussex Tea and Coffee Company’s very own Basil Herbal Tea ensures that you will never see this marvellous herb in the same way, ever again! Packed full of incredible antioxidants, as well as containing magnesium, iron, potassium, and Vitamins C and A, this herbal tisane can help with a vast number of health-related issues. So, forget all of those, admittedly delicious, Italian dishes – for Basil Herbal Tea has the ability to liven your taste buds, whilst also delivering on outstanding health benefits! Originally native to Iran, India, and other tropical regions in Asia, Basil has been used in tea-form for many centuries, spanning across the world. 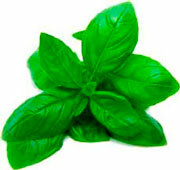 In the Hindu culture, in particular, Basil is revered as the ‘Holy Herb’, and is largely considered to be the earthly manifestation of one of their Gods, Vishnu. It is frequently used during religious ceremonies, as well as sharing a long and expansive history with traditional Ayurvedic Medicine. Even today, Basil Tes is used for common colds, headaches, stomach disorders, inflammation, heart disease, various forms of poisoning, and even malaria! Modern Science has likewise played a vital role in this herbal tea story, with countless studies supporting many of its ancient practices. For more information on how Basil Herbal Tea can help you in your day-to-day life, please see our health benefits section below! Ingredients: Dried Basil Leaves (cut). Brewing Guide: We recommend using 1 teaspoon of the leaf, but if you like a stronger tea, then you could use up to 1½. This tea tastes best with freshly boiled water (roughly 100 degrees) and left to infuse for 5 to 10 minutes. How to Serve: The addition of honey or lemon can be a delightful inclusion into this beverage. However, we believe it is best served as it is. Tasting Notes: When infused to perfection, this beverage will waft irresistibly spicy aromas around the room. Its overall taste, meanwhile, is far more reminiscent of earthy, minty flavours, brought together in a surprisingly creamy cup of tea. Health Benefits of Basil Tea: Now supported by dozens of Scientific Studies, which have since been able to prove correlations between its consumption and the improvement of a number of health-related issues. One such study, conducted by the Indian Journal of Physiology and Pharmacology, discovered that Basil Herbal Tea had the ability to lower blood sugar levels in those living with Diabetes. Further to this, other research has indicated that this incredible herbal tea can help reduce stress, anxiety and even, in some cases, depression! If this wasn’t enough, Basil Tea is also caffeine-free! What more could you possibly want?